LYON, France – Strengthening INTERPOL membership’s capacity to serve national and regional police needs was the focus of an international INTERPOL meeting which closed today. 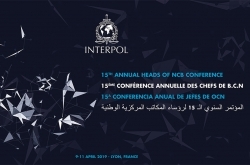 INTERPOL’s 15th annual meeting of Heads of National Central Bureaus brought together 315 senior police officials from 145 countries. Delegates endorsed a series of recommendations to strengthen the crucial role of NCBs in global security, and bring INTERPOL capabilities, particularly its databases, closer to frontline police officers. Interactive presentations took place on INTERPOL’s I-Core project – an initiative aimed at tailoring INTERPOL services to the evolving needs of member countries. Each of our member countries hosts an INTERPOL National Central Bureau (NCB). This connects their national law enforcement with other countries and with the General Secretariat via our secure global police communications network called I-24/7. NCBs are at the heart of INTERPOL and how we work. They seek the information needed from other NCBs to help investigate crime or criminals in their own country, and they share criminal data and intelligence to assist another country. Recognizing the need to strengthen NCB capabilities, the meeting closed with a call to strengthen NCB operational performance; engage in regional partnerships; and boost cyber analytical and operational capabilities. During the three day conference delegates were briefed on a range of initiatives aimed at supporting and modernizing NCBs in all regions. 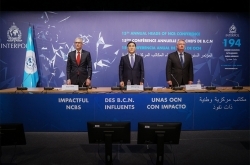 From 9 – 11 April, INTERPOL’s 15th Heads of National Central Bureau (NCB) conference enabled 145 countries to endorse a series of recommendations to strengthen the crucial role of NCBs in global security, and bring INTERPOL capabilities, particularly its databases, closer to frontline police officers. Boosting biometric database accessibility globally, particularly at border control, was high on the agenda, with a specific panel dedicated to INTERPOL’s operational and investigative NCB support services. During expert panels, Heads of NCB saw how organized crime is increasingly using the Darknet and cryptocurrencies in cyberspace, with demonstrations of INTERPOL capabilities available to NCBs through INTERPOL’s Global Centre for Innovation in Singapore. Interactive presentations on INTERPOL’s I-Core project – an initiative aimed at tailoring INTERPOL services to the evolving needs of member countries – enabled NCB heads to devise ways to strengthen performance and raise their police leadership profile at national level. As part of efforts to remove financial incentive for global organized crime, delegates heard how the General Secretariat is enhancing financial investigative capabilities for member countries to enable them to undermine organized crime’s business model through increased asset confiscation. The meeting heard NCB testimonials about the impact of INTERPOL services in member countries, including a presentation by Kenya’s Anti-Terrorism Director on the Nairobi terrorist attack last January, and the deployment of an INTERPOL Incident Response Team within 24 hours of the attack. Regional roundtable meetings enabled Heads of NCB to discuss common law enforcement challenges and determine how INTERPOL’s global capabilities and services are being used to overcome them, and how they could be improved. boost cyber analytical and operational capabilities through the creation of dedicated cybercrime units within national law enforcement structures.